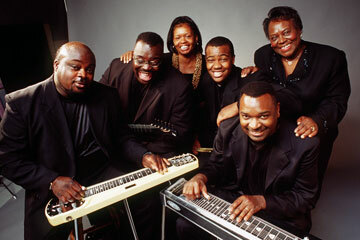 It's all in the family for sacred steel band the Campbell Brothers. "Can You Feel It?" is the title of the latest CD from sacred steel guitar masters the Campbell Brothers, and they're hoping a Hawaii audience will be rocking with that glorious gospel sound this weekend. From the initial influence of the Hawaiian steel guitar, the African American Pentecostal church took that sweet sound and made it a keening appeal to the spirit that dates back to the late 1930s. The sacred steel sound approximates the human voice singing hymnals, helping provide praise music that should transform the Leeward Community College Theatre into an impromptu church filled with the holy spirit. And with Chuck Campbell on the pedal steel and brother Darick on the lap steel, it's double the sound. Katie Jackson belts out the gospel, and brother Phil and his son Carlton round out the rhythm section. The concert begins 8 p.m. Saturday at the Leeward Community College Theatre. Tickets are $23 general and $19 students, seniors and military. Call 455-0385.